Mad Mouse is a misnomer. This prank is really meant to drive your victim mad through the mouse settings. There are a couple of things you can do with the settings which you can access via "Control Panel->Mouse". It works for all Windows XP, Windows Vista and Windows 7. The most common setting to start your prank of with is to check the "Switch primary and secondary buttons" checkbox (or uncheck it, if it was originally checked). You can find it in the "Buttons" tab. This will definitely confuse your victim who's not expecting a switch in buttons. The next setting you can play with is the double-click speed. If it's not already set to the fastest setting, do so and watch your victim click in vain to open up a folder or an application. You can also play with "ClickLock". Check the "Turn on ClickLock" box and click on the "Settings..." button. Change the setting to "Short" and click "OK", as shown in the picture above. Now every time your victim clicks and releases the left mouse button, the cursor will behave as if the button was not released and select anything your victim moves over! 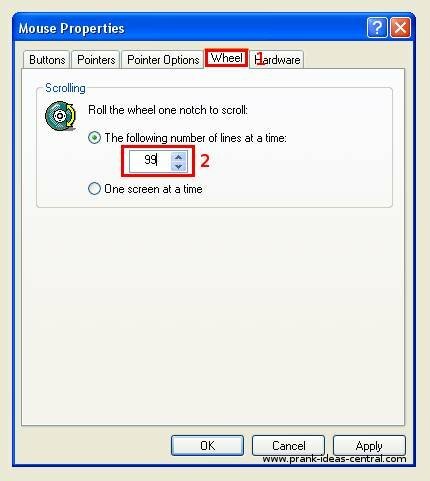 If your victim is an avid internet reader and just adores using the mouse wheel, click on the "Wheel" tab and set "The following number of lines at a time" to 99, then click "OK", as shown in the picture above. The next scroll your victim performs will likely land them at the bottom of the next webpage or document they read. Still bent on mayhem? Try changing the pointer speed to very slow or very fast in the "Pointer Options->Motion" tab. What can be more bewildering than not being able to access ANYTHING on your Windows desktop? Check out this Windows prank idea for a step-by-step guide to prank your victim. You can choose version 1 or version 2 of this Windows prank. To make a wallpaper that looks like your victim's desktop, press the "Print Screen" button on the keyboard. Open up Microsoft Paint in "Start->All Programs->Accessories->Paint" and paste the desktop image (Ctrl-V, if you're not sure). Save the file in "My Pictures" or anywhere out of view away from the desktop. In Version 1 of this windows prank, you created an exact replica of the desktop. In Version 2, you will learn how to create an inaccessible "folder" on the desktop. First, create a new folder and name it provocatively to catch your victim's attention. Press the "Print Screen" button, and save the resulting image in Microsoft Paint as in Version 1. Delete the folder you created, then set the new image as the wallpaper. Every other icon will be accessible, except the new "folder" you created. Potentially amusing, isn't it? For Windows XP: Next, right click on your desktop to bring up the context menu, then go to "Arrange Icons By -> Show Desktop Icons". That should hide all the icons on the desktop. For Windows Vista and Windows 7: Right click on an empty area on your Desktop. Click on "View->Show Desktop Icons" to uncheck it. That should do the trick. The Youtube video above applies to Windows XP and versions above (Except Windows 7 Starter). However, there are different ways to access the Display Properties menu for each version, as written below. For Windows XP and Vista: Right click on the desktop again and click on "Properties". Go to the "Desktop" tab and choose your fake desktop wallpaper. A simpler method is to go straight to your Fake Desktop Wallpaper file and right click on it. In the context menu, click "Set as Desktop Background". Voila! For Windows 7: Right click on an empty space on your Desktop. Click on "Personalize". Navigate to desktop backgrounds and select ONLY the Fake Desktop Wallpaper, then click "Save changes". If your victim set the wallpapers to change every hour, and if you have the time, you might like to create multiple versions of the Fake Desktop Wallpaper and set it to change as usual. Note that this step probably won't work on Windows 7 Starter. While there is a workaround to do this, I believe it's too impractical able to setup this Windows prank on a victim's computer. As a final step, right click on an empty part of the Taskbar, and click "Properties". Check "Auto-hide the taskbar" and click "OK". Make sure the Taskbar hides itself away. A better way to do this is to unlock the Taskbar by right clicking an empty part of the Taskbar and making sure "Lock Taskbar" is unchecked. Then put your mouse on the top edge of the Taskbar and drag it down to hide it from view. Enjoy as your victim tries to open up icons on his or her desktop in vain.